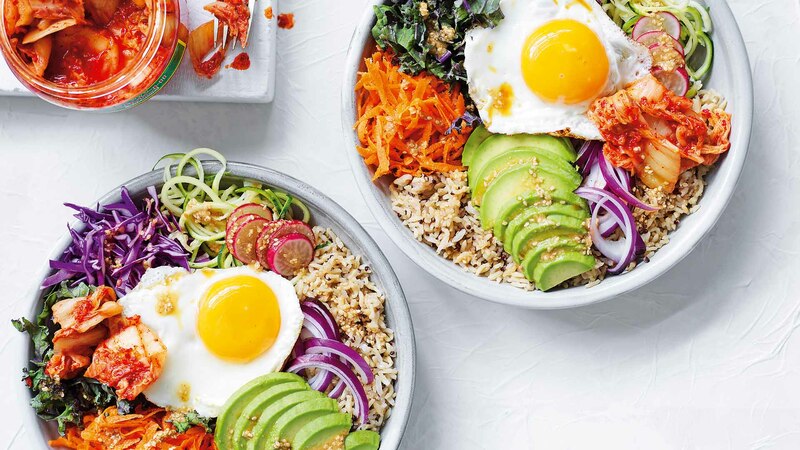 Avocado, shredded cabbage and a tahini dressing take this breakfast bowl to delicious heights. 1. Make the dressing by combining all the ingredients in a bowl. Whisk and set aside. 2. Make the salad by dividing and placing the salad ingredients, together with the kimchi, around the sides of two serving bowls. 3. Poach or pan-fry the eggs (we like ours sunny-side up) and, during the last minute of cooking, microwave the rice and quinoa. 4. Place half the contents of the rice and quinoa packet into the middle of each prepared serving bowl. Top with one egg per bowl and garnish with the fresh sliced chilli (if using). 5. Drizzle dressing over the top of the eggs (note: we like to use HEAPS!) and serve immediately. If you want to make this in mere minutes, use the grating attachment on your food processor to grate the cabbage, carrot, onion, radish and cavolo nero. Leftover dressing can be popped into a jar and stored in the fridge for up to a week. If you can't get your hands on cavolo nero, use kale ribbons. Super Green Simple and Lean by Sally Obermeder and Maha Koraiem is published by Allen & Unwin.